"Learning and Living the Journey of Faith"
2018 Volunteer group projects included Squash Hunger, Race Against Racism in York, Nixon park projects (see below) and Christmas Magic Food concession stand supporting Nixon Park education partner. 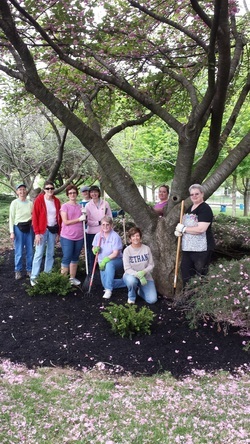 Many of our members continue to do volunteer work o their own such as a Hershey Park Volunteer, Martin Memorial Library, York Literacy Council, Dover Family Clothes Tree, and community work such as library work and council work. In 2018 our volunteer hours once again totaled more than 200 hours. 2018 Creation Justice included tending to the trees we planted at Nixon Park, participating in a Garlic Mustard Pull (invasive non-native plant) at Nixon Park, planted trees at Nixon Park, toured Horn Farm and learned how they are teaching next generation farmers to work with the land and environment, held a project to help our group to understand their impact on the environment in relation to water, electricity, and excessive food storage, along with many conversations about ways to preserve our environment and natural resources. 2017 Volunteer group projects include Apple Harvest For Hunger, Squash Hunger, Race Against Racism in York, Christmas Magic Food concession stand supporting Nixon Park education partner, and working with Margaret Moul Home and enjoying a Christmas sing along with them. Many of our members continue to do volunteer work on their own such as a Hershey Park Volunteer, at Petco with the ASPCA animals, Red Cross blood drives, Martin Memorial Library, York Literacy Council, and Dover Family Clothes Tree. Our volunteer hours totaled more than 200 hours for 2017. 2017 Creation Justice included tending to the trees we planted at Nixon Park, participating in a Garlic Mustard Pull (invasive non-native plant) at Nixon Park, won our third recycled art project for Go Green Sunday through UCC York Association, became a Creation Justice congregation through UCC, along with many conversations about ways to preserve our environment and natural resources. Swamp plant planting at Nixon Park on Saturday May 28. We prepared for muddy planting but didn't expect the hottest and most humid day of the year thus far. We purchased and planted native bushes and trees for the new wetlands area. We also put up dragon fly posts so the dragon fly's had a place to land and enjoy the sunshine. October 1st we participated in another swamp planting at Nixon Park. ​Once again this year we helped reach out to The Margaret Moul Home by assisting with “A Night at Naylor’s Event, and concession stand at the York Revolution’s game. Some helped with York’s annual Race Against Racism. Participants also contributed food items and gave time to assemble snack bags for the York Association Group Work Camp. Many of our members continue to do volunteer work on their own such as a Hershey Park Volunteer, at Petco with the ASPCA animals, Red Cross blood drives, Martin Memorial Library, York Literacy Council, and Dover Family Clothes Tree. We purchased and planted 8 juniper bushes, 20 native plants, and mulch. And then helped the Egrets at Kiwanis Lake by planting them and giving their young a place to "hide" while learning how to fly and take care of themselves. Took part in April 19th Earth Sunday Service oriented to Creation Care Theme. Attended the Open House of the Dover Township Wastewater Treatment Plant and shared in discussion hour about our learnings. 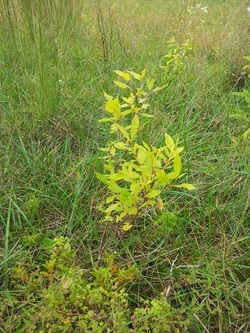 Planted tree and shrub seedlings at Nixon Park along the creek to help stabilize the erosion. Discussed how to encourage recycling at the Courtyard Marriott and found out the township is the holdup of this project for Marriott. Received a Penn Central Conference Green Justice Congregations designation at Annual Meeting 2014. Completed a carbon footprint calculation for each members household and held a discussion on how all households can decrease their carbon footprint. Viewed a film clip and discussion on the Renewal DVD on Environmental Sustainability and food choices. Presentation by John Bechtel from the Board of PA Interfaith Power and Light. Became member of PA Interfaith Power and Light. Discussed purchasing renewable generated electricity for our homes with congregation. Financially supported Heifer Project for clean water, irrigation pump, and tree seedlings. Financially supported Emmanuel UCC to support PA Interfaith Power and Light. We are keeping an eye on our tree planting in Hopewell Township this past spring. We have some little sprigs that are continuing to hang in there. We planted over 300 of the following: Button Bush, Osier dogwood (red twig), Winterberry Holly, Choke cherry and the American Cranberry Viburnum. Planted large trees at Kiwanis Lake/Farquhar Park with York TreeVitalize Program. Took part in the UCC Mission 4/1 Earth 50 days, taking time each week to share with each other our Creation Care actions. Received a Penn Central Conference Green Justice Congregations designation at Annual Meeting 2013. Viewed clips from the National Geographic documentary, “Human Footprint” and discussed. Purchased and planted 300 native seedlings at Hopewell Township Park Bird Habitat. Shared films and books related to creation care and environmental concerns. Discussed and shared on Greening our Christmas and Holiday celebrations. Wrote a letter for York Association Newsletter about our Creation Care Activities. Financially supported UCC.org/Earth for planting trees with Arbor Day Foundation. Financially supported Kenya Green Belt Movement tree planting project. EUCC purchased and planted three gardens at Hoffman Homes for Youth at the Emmanuel Home. Many of the plants were native plants to the area and should be beautiful once the reseeding process takes hold.